If it's a genuine San Francisco police thriller then it has to include the old Hall Of Justice. This movie is no exception. Then ... 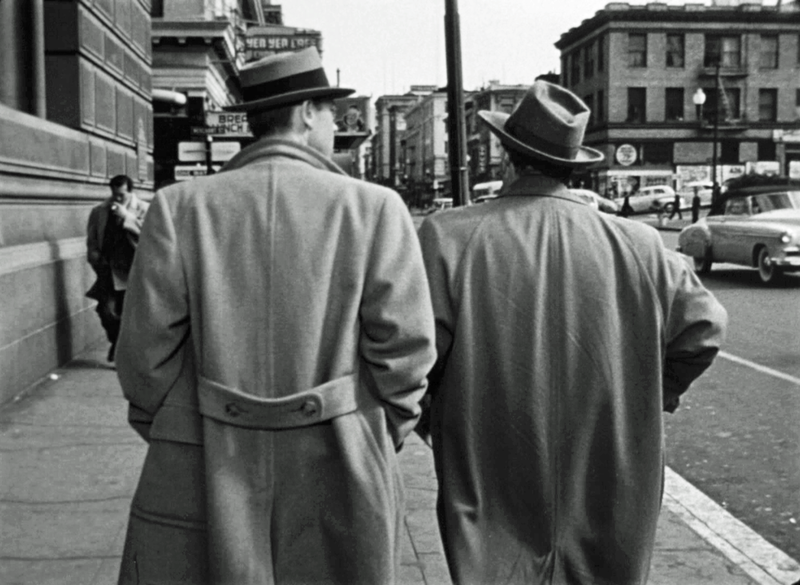 Taking a break from the murder investigation the two brothers leave the Hall Of Justice, stepping out to Kearny Street for a Chinese lunch. The same shot was used a year earlier in the 1949 movie Impact. ... and Now, the old Hall Of Justice faced Portsmouth Square Plaza from its location at 750 Kearny Street in Chinatown. It was demolished in 1967 and replaced by a Holiday Inn hotel, now the Hilton San Francisco Financial District (map). Then ... They walk the few steps to the Yen Yen Cafe at 716 Kearny on the corner of Merchant Street. Its sign juts out, just above Andy's fedora. 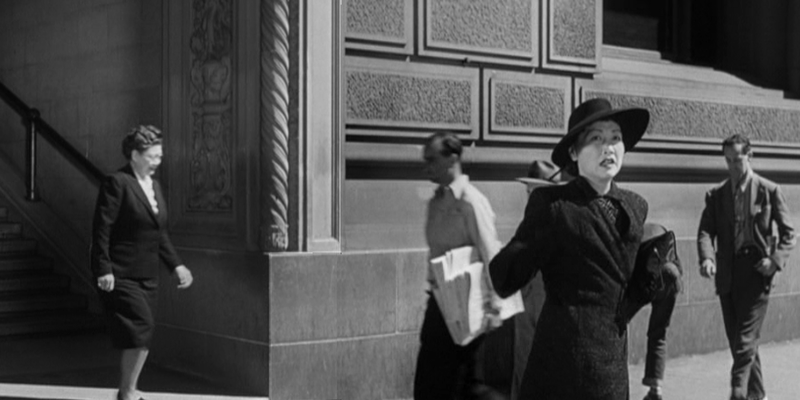 Three years earlier in the 1947 movie The Lady From Shanghai, the identical camera placement captured Orson Welles fleeing from the Hall of Justice with the Yen Yen Cafe sign again clearly visible. 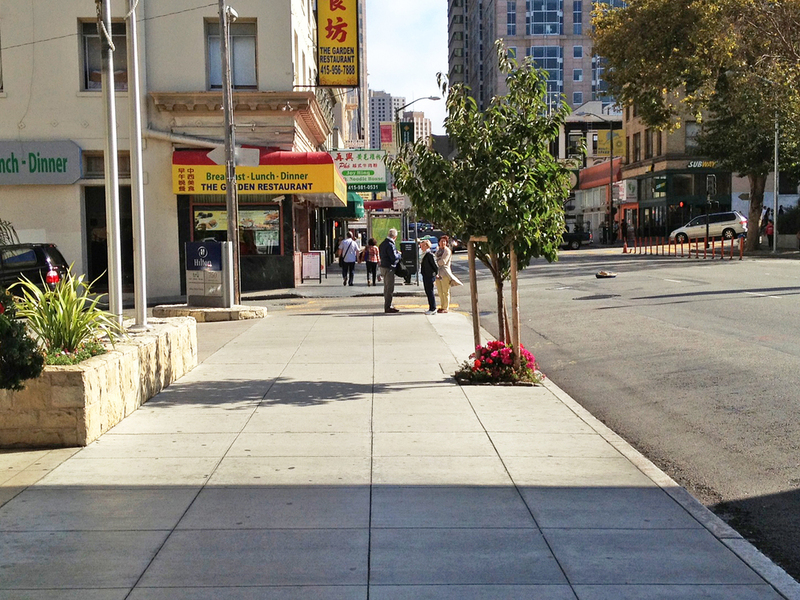 ... and Now, there's still a Chinese eatery, the Garden Restaurant, at that corner location. But at left we see that the imposing Hall Of Justice is gone. Then ... Inside the cafe Andy cannot understand why Ed persists in trying to pin the Frazer murder on the youth who shot the liquor store owner. Yes it was the same gun but the evidence suggested he didn't have access to it until after Frazer was killed. Portsmouth Square Plaza is seen across Kearny through the window but what's that white building in the park? ... and Now, the plaza today is no longer a gently sloping open space - it was sacrificed to make way, behind these trees, for an uninspiring two level park with underground parking. And that white building? It was a replica of the city's first schoolhouse, originally located at Portsmouth Square, which happened to be on display in the plaza for the California Centennial observance when the movie was filmed. Here's the schoolhouse in 1951 as it was being moved from the plaza to City College, slated to be a museum exhibit. There isn't a view of the front of the Yen Yen Cafe in the movie but in this capture from The Lady of Shanghai filmed three years earlier as Rita Hayworth runs through the plaza we can see the half block of Kearny between Merchant (just off the left edge of the picture) and Clay Street to the right. The white van on the left is parked in front of the cafe. 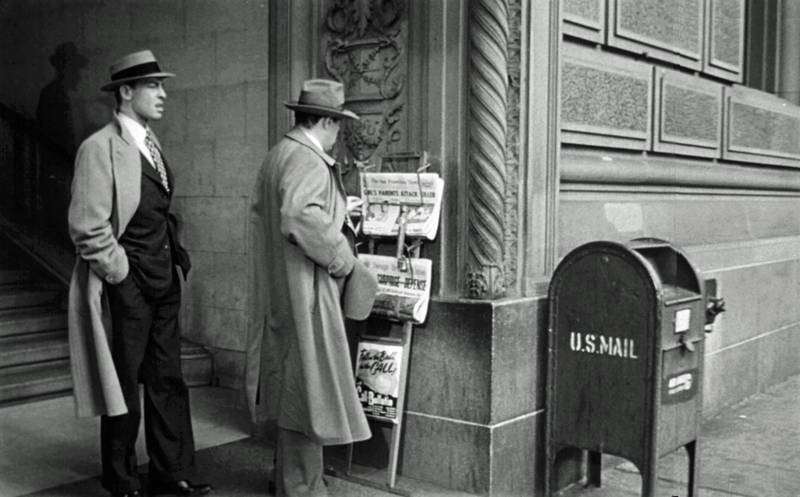 The awning just to the right of the van belonged to Puccinelli Bail Bonds at 714 Kearny (also visible in the other Lady From Shanghai image above). ... and Now, the half block today still looks the same except for different store tenants. The Garden Restaurant at left has expanded from the original Yen Yen Cafe corner space and now spans the full width of the host Wood Building.